Cornley Polytechnic Drama Society continues to fail upwards, now finding itself the winner of the BBC’s Community Choice Award, and its infamous production of Peter Pan accordingly unleashed upon a live studio audience, with narration by none other than David Suchet. Mischief Theatre, creators of the Olivier-award winning The Play That Goes Wrong and The Comedy About the Bank Robbery, has made some canny moves to share its festive metatheatrical treat through the medium of live television. While there’s a slightly feverish sense that Mischief Theatre have tried to cram every joke from the stage show into this one-hour slot, it does mean that the gag rate is exceptionally high, and the camera catches the exquisite and excruciating details of the company’s physical comedy that might be missed from the stalls. In the first 10 minutes, Henry Shields’ creation Chris, the company’s director slides through an impossibly small gap between door and frame playing Mr Darling, such that his ears are folded forward onto his sideburns, whilst he grins through gritted teeth like Basil Fawlty, refusing to acknowledge that anything has “gone wrong”. Shields’ actor-manager insists that Peter Pan is not a pantomime –it is rather a traditional Christmas vignette – and this artistic inflexibility translates well to live broadcast, where nothing is so unforgivable as an inability to roll with the punches. The desire for control constantly stymies these poor characters, and the petty cruelties that they deal to one another are the deeply funny core to this piece. David Suchet begins proceedings with a feigned celebrity’s good humour, but as the cast members start dropping – literally – he steps in with his own tactics to keep the show rolling, even stealing Captain Hook’s moustache for a momentary nod to Hercule Poirot. The team aren’t afraid to make changes to fit the format, and indeed the broadcaster: Chris Leask’s clueless stage manager Trevor is given a new lease of life by pitting him against BBC Studios staff, keeping them at bay while he deals with mechanical, electrical and pyrotechnical mishaps, while the reason that the cheerily untalented Max (Dave Hearn) is included in the company is that his aunt “runs the BBC”. A well-judged prerecorded opening segment introduces each of the characters – delivering plenty of laughs in its own right – and sets the stage for other recorded incursions, including a climactic runaway pirate ship gag which demonstrates just how involved and good-humoured the Corporation were in adapting the show for this one-off broadcast. 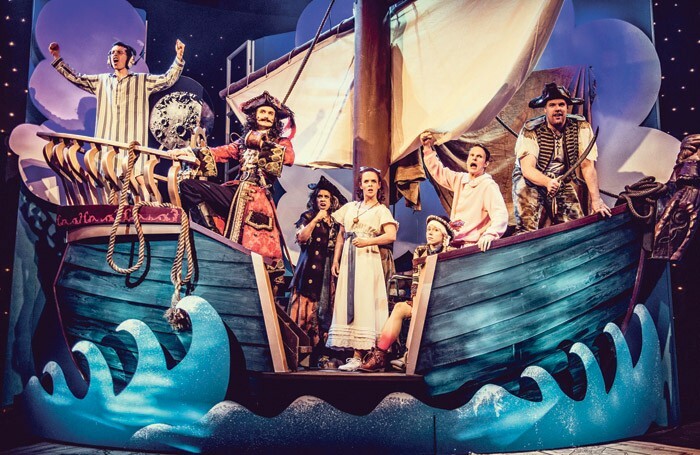 Perhaps best are those moments that need no translation – props failing and actors fluffing – but Peter Pan Goes Wrong is also a model for cross-platform collaboration, milking every possible benefit of a new format.